Sushi fans will love this selection, which features four types of California rolls; four varieties of nigri; and three types of hoso, plus dipping soy sauce, pickled ginger and wasabi condiments. 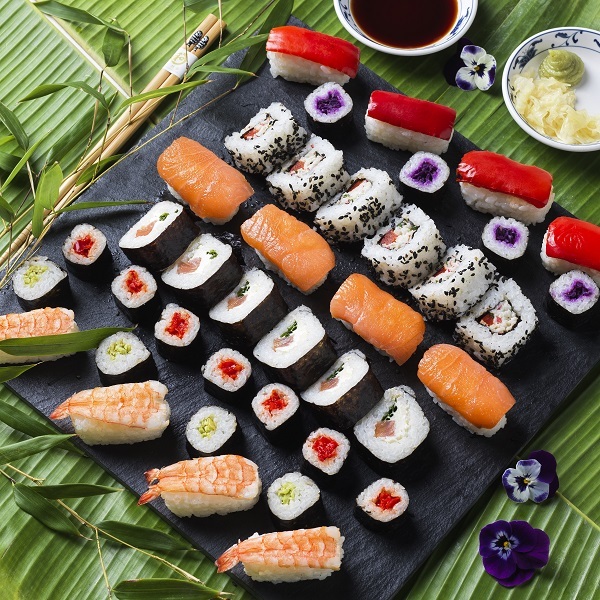 Sushi Rice (Rice, Water, Sugar, Rice Wine Vinegar, Salt, Rice Wine), Red Pepper (6%), Salmon (Salmo salar) (Fish) (4%), Sesame Seeds, Skipjack Tuna (Katsuwonus pelamis) (Fish) (2%), Water, Prawns (Pandalus borealis) (Crustacean) (2%), Full Fat Soft Cheese (Cows' Milk), King prawn (Penaeus vannamei) (Crustacean), Edamame Bean (Soya), Pasteurised Free Range Egg, Cucumber, Carrot, Sugar, Ginger, Nori Seaweed, Rapeseed Oil, Salt, Horseradish, Red Cabbage, Chives, Soya Bean, Wheat, Wasabi, Tapioca Starch, Pasteurised Free Range Egg White, Spirit Vinegar, Distilled Vinegar, Cornflour, Potato Starch, Pasteurised Free Range Egg Yolk (Egg Yolk, Salt), Red Chilli Puree, White Wine Vinegar, Ginger Puree, Rice Wine Vinegar, GarlicPuree, Alcohol, Dried Garlic, Citrus Fibre, Dried Red Pepper, Mustard Powder, Mustard Seeds, Carrot Extract. Keep refrigerated. Once opened consume immediately. This product is not suitable for home freezing.